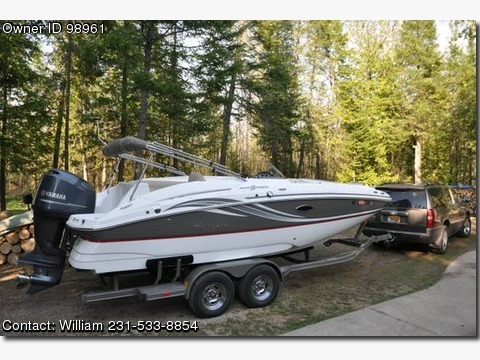 Boat is located in Bellaire,Michigan.Please contact the owner @ 231-533-eight eight five four or bill1484(at)charter(dot)net...ASKING PRICE IS $10,000 LOWER THAN A NEW 220 HURRICANE.....TRANSFERRABLE WARRANTY AND THIS HURRICANE HAS OVER $4,800 IN OPTIONS AND A CUSTOM TANDEM AXLE TRAILER Yamaha 250hp Outboard Motor. Like New 22' Hurricane Deckboat Take a good look at this Hurricane SS 220 model. Great set up for cruising or water sports. The Yamaha F250 provides plenty of power and this Hurricane comes with over $4,800 in options Options include: Full boat cover Ski tow bar Stern washdown hose Compass Depth finder (in dash) Snap in carpet Stainless steel cupholders Bow table Pump out electric flush toilet iPod adapter for the upgraded stereo Pull up cleats Soft touch vinyl furniture Custom Phoenix Tandem Axle Trailer with fixed bunks, load guides and swing tongue. Call for additional photos of this boat.